Location : the French Catalonia, just a few kilometers from Spain, at the North West of Perpignan, the AOC goes on 32 villages and stretches around the Agly river Valley up to Saint Paul. Bordered on the Northern part by the limestone Corbières massif towering at 1200m, on the Eastern part by the Roussillon plain, at the South by the Têt Valley. Famous Grenache from Maury which natural hotheadedness is balanced by cooler Syrah and Carignan from Belesta and Caramany. A huge diversity of soils can be found in this small part of the Roussillon, the most interesting are the black schists around Maury, gneiss at Belesta and Caramany, brown schists in Latour de France, granits in Lesquerde, limestone clay and “galets roulés” around Tautavel. Four terroirs were distinguished for their originality, their specific production and the high expression of their wines. 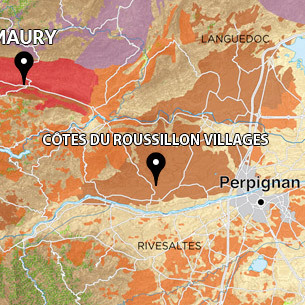 These 4 villages are allowed to add their proper name to the one of the AOC Côtes du Roussillon Villages: Latour de France, Caramany, Lesquerde and Tautavel. Utmost area, Roussillon is the suniest vineyard in France with so poor rain falls on the region, never exceeding 500mm in a regular year rarely through a fine and effective drizzle but more through short showers sometimes violent and strongly trickling. The other major climatological fact is the Tramontane, this powerful North – North West wind which is a real dryer for the vine even if is also useful to preserve the best sanitary conditions. In the “Villages” part of Roussillon, the best hills are located in the most temperate areas. Here, altitude, Northern exposure and locally some fresh air flows (under the influence of the Corbières foothills for instance) are the factors which enable to balance the violent sunny heat proper to the Roussillon. We usually base our Catalan blend on the famous Grenache from Maury which natural hotheadedness is balanced by cooler Syrah and Carignan from Belesta and Caramany. 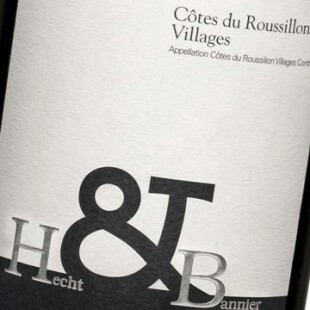 The best Mourvèdre from Tautavel usually come to complete the blend with more relief.